I know there are lots of people out there who would qualify as goat cheese fanatics. Many of my best friends fit into this category. While I do enjoy goat cheese, it isn’t a guaranteed hit for me. The texture and the flavor have to be right. If it’s overly tangy or too crumbly, I’ll pass, but when it is right, it can be downright dreamy. Recently I tried a whipped goat cheese dip with caramelized onions at a restaurant and I basically haven’t been able to stop thinking about it. And when that happens, the only remedy is to find a way to make it at home. 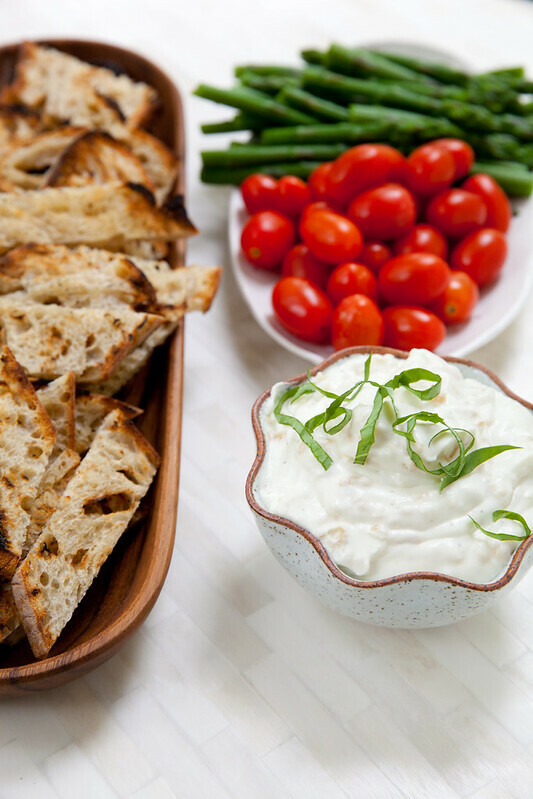 This dip is a perfect example of elegant simplicity. Just a handful of ingredients and minimal prep work give you this addictive creamy dip that is like a way sophisticated and way more delicious version of the onion soup dip from our semi-homemade days of high school or so. 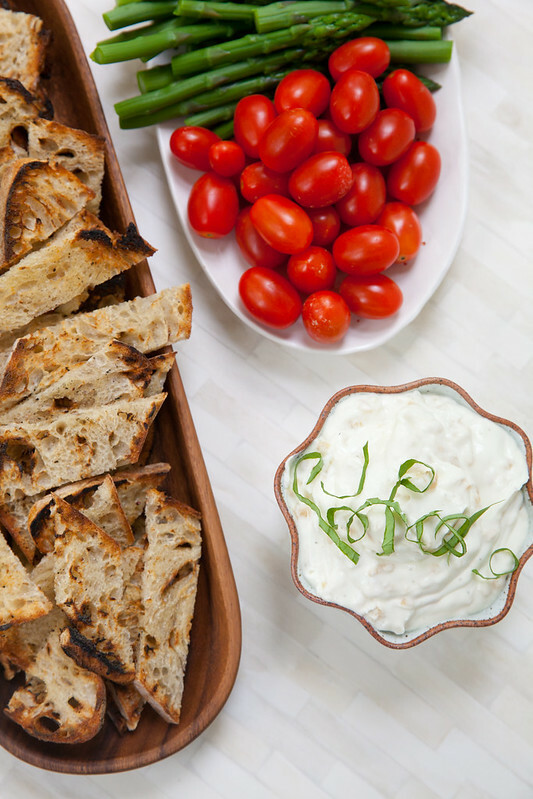 Serve with veggies, grilled bread, or any other edible item that serves as a delivery vehicle for getting it into your mouth as soon as possible. In a large skillet, heat the oil over medium heat. Add the onion to the pan, season with salt and pepper and add the sugar. Reduce the heat to medium-low and cook, stirring occasionally, until the onion has fully softened, browned and caramelized, about 30 minutes. Remove from the heat and let cool. In the bowl of an electric mixer, combine the goat cheese and 3 tablespoons of the heavy cream. Mix until incorporated, then increase the speed and begin to whip. Continue whipping until smooth and fluffy, adding additional cream as needed 1 tablespoon at a time. (The total amount needed will vary depending on the initial texture and moisture content of your goat cheese. Adjust as needed to achieve your desired texture.) Once the dip is whipped and smooth, stir in the garlic and the caramelized onions. Chill until ready to serve. Note: With only one clove of garlic, the garlic flavor here is subtle. If you want more, feel free to increase it. If you aren’t a fan of raw garlic, add it to the onions at the end of cooking and cook just briefly, 1 minute or so.